Yep, this happened, and it was awesome. We have been looking for an opportunity to make these, but couldn’t justify the copious amounts of butter and sugar involved. Well, I (Leah) wanted to bring in food for my lunch table for the day before Fat Tuesday/Mardi Gras, and that served as the ideal way to get rid of nine cupcakes so our family wouldn’t eat all of them. We were very pleased with how they turned out (other than the fact that Celine added half the amount of baking powder to the cupcake batter itself. We do not recommend making this mistake)! The frosting was heavenly! It somehow had both the qualities and flavors of both cookie dough and basic buttercream frosting at the same time. The cookie dough filling was simple and delicious to make. Our only change that we may make is using a different cupcake base, perhaps just a typical yellow cake or chocolate cake next time. This one was a little on the rich side (don’t look at the amount of butter!!). But whatever you choose to do, no one will be disappointed with these! P.S. 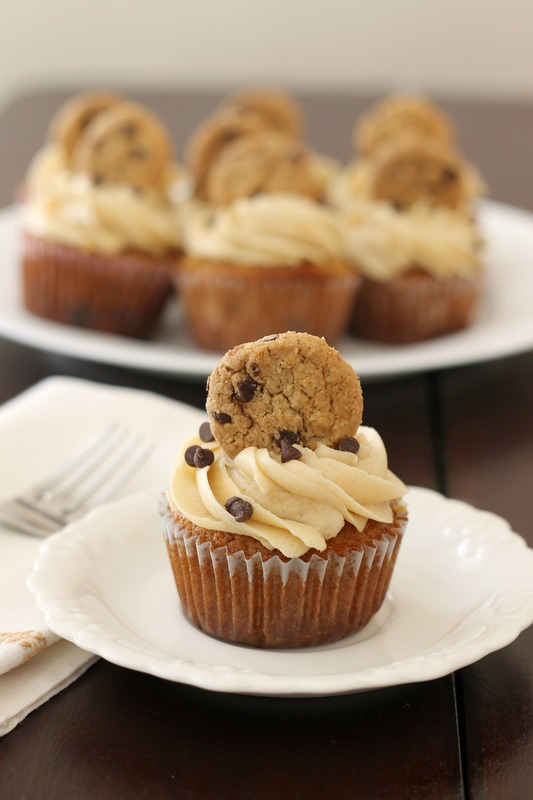 Since the cookie dough in these involves no raw eggs, the cupcakes are completely safe to eat! We are the type of people who never, ever eat things with raw eggs, even though they are usually fine for healthy people to eat. You never know, and we like to be on the safe side! Preheat the oven to 350° F. Line two cupcake pans with 24 paper liners. In the bowl of a stand mixer fitted with the paddle attachment, combine the butter and brown sugar. Beat together on medium-high speed until light and fluffy, about 3 minutes. Mix in the eggs one at a time, beating well after each addition and scraping down the sides of the bowl as needed. Divide the batter evenly between the prepared cupcake liners. Bake for 18-20 minutes, or until a toothpick inserted in the center comes out clean. Allow to cool in the pan 5-10 minutes, then transfer to a wire rack to cool completely. Combine the butter and sugar in a mixing bowl and cream on medium-high speed until light and fluffy, about 2 minutes. Beat in the flour, sweetened condensed milk and vanilla until incorporated and smooth. Stir in the chocolate chips. Cover with plastic wrap and refrigerate until the mixture is firm, about an hour. Beat together the butter and brown sugar in the bowl of a stand mixer fitted with the paddle attachment until creamy. Mix in the powdered sugar until smooth. Beat in the flour and salt. Mix in the milk and vanilla extract until smooth and well blended. Frost the filled cupcakes (we used a piping bag), and sprinkle with mini chocolate chips and top with mini chocolate chip cookies for garnish. Store in the fridge if you don’t plan on serving within a couple of hours. Enjoy!